NSERC has finally responded to the multiple articles, blogs and editorials criticizing the declining success rate in its postdoctoral fellowship program. It is unfortunate that they chose to do so through a media outlet that is sitting behind a pay wall. Under the title “NSERC’s overall spending on post doctoral fellowships is increasing despite criticism”, the magazine “Re$earch Money” relates NSERC’s official position, quotes Isabelle Blain, VP for research grants and scholarships, and includes a couple of NSERC generated tables that we analyse below. The new calculus used by NSERC to explain their numbers reveals a new dirigisme that our young scholars will be contending with for a while. What I think Blain meant to say is that NSERC has multiple outlets for its support of postdoctoral fellowships: One provides a direct source of support, namely through the traditional postdoctoral fellowship program and its industrial counterpart (IRDF). Another source of PDF support is indirect and capitalizes on one of the multiple uses of the traditional Discovery Grants as well as the relatively new CREATE program. Much information can be extracted from the following tables provided by NSERC to “Re$earch Money”. First, we get a confirmation –through the last 3 columns of the first table– of what has been reported by many articles and blogs: the number of opportunities through the traditional PDF program has been dramatically reduced. In the past 7 years, the number of awards has dropped from 255 in 2006 to 98 in 2012, and the success rate from 25.4% to 7.8%. The second table offers additional insight. For one, the numbers for the critical 2011-12 years aren’t there. Moreover, the discrepancies between the numbers of non-industrial awards reported in Column 6 of Table 1 and those in Column 2 of Table 2 is puzzling. Since the awards span 2 years, one would expect the number for 2010-11 (say) to be the sum of the awards for 2010 and those of 2011, that is 286+133= 419 and not the reported 526. The first real surprise however is to see that the numbers of the industrial PDFs (IRDF) are essentially unchanged –from 223 in 2005-06 to 225 in 2010-11. Besides showing that the total number of PDFs through the direct program (traditional or industrial) has been declining, this begs the question as to why is it the case, considering NSERC’s huge efforts to promote IRDF. Indeed, many of the applicants who don’t get the traditional PDF receive a letter from NSERC pre-approving them for an industrial PDF provided they can find an industrial partner to co-sponsor them. Is it conceivable that this approach by NSERC is not doing the job? And doesn’t it also mean that most of our postdoctoral applicants are opting to go to the US or Europe instead of taking the IRDF route? NSERC’s fellowship calculus seems to have been relying on the PDFs that are supported indirectly via its other programs, particularly through the Discovery Grants (DG). Notwithstanding that the budget for the DG program has been stagnant for years, NSERC seems to keep shifting to it the burden of covering for the programs it is currently downsizing such as the PDF program and the Research Tools and Instruments (RTI). The bulk of the discovery grants is used anyway to support graduate and postdoctoral fellowships, but it is a fact that the DG budget has been stagnant for years with no reprieve in sight. So how –if we are to agree with Table 2– could the number of DG-supported PDFs be going up? For an answer, NSERC credits the so-called “Accelerator grants”, a new component of the DG program that remains a mystery to Canada’s scientific community. Indeed, every year a select few of DG applicants get these additional grants, yet no one knows how these selections are done and on what basis. It suffices to say that a non-trivial number of such choices have been puzzling enough and so unexpected that more transparency in the process may be warranted. Another unknown piece of the puzzle is how much of the accelerator’s budget is really new and how much of it is being siphoned off from an already depleted and oversubscribed DG pool. Notwithstanding that these grants seem to discriminate royally against senior researchers who –you would think– still have something to offer to the mission of training future scholars, the bottom line is that the value added in terms of real dollars to young scholars may be close to zero. My own take on why the number of PDFs is increasing through the DG program is simply that investigators are shifting a larger portion of their grants to support HQPs. At the same time, they are being more creative in leveraging their grants with university resources to fill the gap in positions that NSERC is providing no more through its traditional postdoc program. Last but not least in terms of the indirect support for PDF is the newly created “Collaborative Research and Training Experience” (CREATE), as it is becoming clear that this is the place where much of the funds for the traditional PDF competitions has been going. But this post is getting long, so let’s summarize the main issue with such a re-allocation of resources. A CREATE team must include the acquisition and development of important professional skills among students and postdoctoral fellows that complement their qualifications and technical skills, in order to facilitate the transition of new researchers from trainees to productive employees in the Canadian workforce. Up to 50 percent of the CREATE grants will be dedicated to the industrial stream. The additional objective is to support improved job-readiness within the industrial sector by exposing participants to the specific challenges of this sector and training people with the skills identified by industry. And here is a paragraph that doesn’t sound very welcoming to our fresh PhDs. In other words, many of our graduates are neither eligible, nor interested in pursuing PDFs through CREATE. Yet, this is where NSERC seems to want to put its resources. This is our own Canadian version of “Dirigisme”, a subject that we will surely revisit soon and often. This entry was posted in Op-eds, R&D Policy and tagged CREATE, Dirigisme, discovery grants, NSERC, postdoctoral fellowships. Bookmark the permalink. Sometimes I wonder if the Director of NSERC actually reads the programs that NSERC administers. As you note, the CREATE system does not favour PDFs. In fact, with it its emphasis on HQP numbers, proposing to train PDFs is a great way to NOT get a CREATE. I don’t understand how anyone could lump a CREATE program in with PDF training. CREATE certainly targets HQP but not PDFs. Further, for HQP in CREATE, the biggest problem for CREATE is that there are no research funds allowed. More worrisome, this reduction in the supply of materials and supplies may be a trend across new initiatives. For example, the recent CU-I2I’s only allow 25% of the budget to be allocated to materials and supplies or user fees. While this sounds like a lot, this means that every PhD (20K) only gets 5K in supplies as well as user fees. For heavily applied CU-I2I projects, this is frankly impossible. Thus for HQP in CREATE and other programs, these programs don’t support actual research costs, only the training stipends. Needless to say, this adversely impacts their training experience. You refer back to your assertion that NSERC is losing touch with its researchers. I have a few experiences that suggest that you are likely right and in my experience, the IRDF program is a prime example. The very simple reason that the IRDF is not successful is that a professor, his very bright student and the industrial researcher could not understand the forms, how to fill them out and in what order. So we gave up. When we complained to NSERC, NSERC provided an instruction checklist for the exhaustive list of forms that need to be filled out. It is a bad sign when one needs a checklist to apply to sponsor a student. At the end of the day, I’m more optimistic than you about the future of PDF training. All of my PhD graduates have gotten PDFs or gone to work directly with industry by choice. As a graduate chair of roughly 100 MSc/PhDs, I haven’t heard any horror stories. So, is there a crisis in PDF training? Maybe, but other than NSERC reducing an established program, I’m not sure there is. What may be happening is that PDF training is largely occurring on a project basis. I don’t agree with this shift, empowering our students is the best way to increase STEM activity. Afterall, every PhD graduate is an amazing combination of smarts, dedication and perseverance. Let’s hope that NSERC remembers this and begins empowering our students once again. Blogs like yours will hopefully prod their memory, thanks for pursuing this. 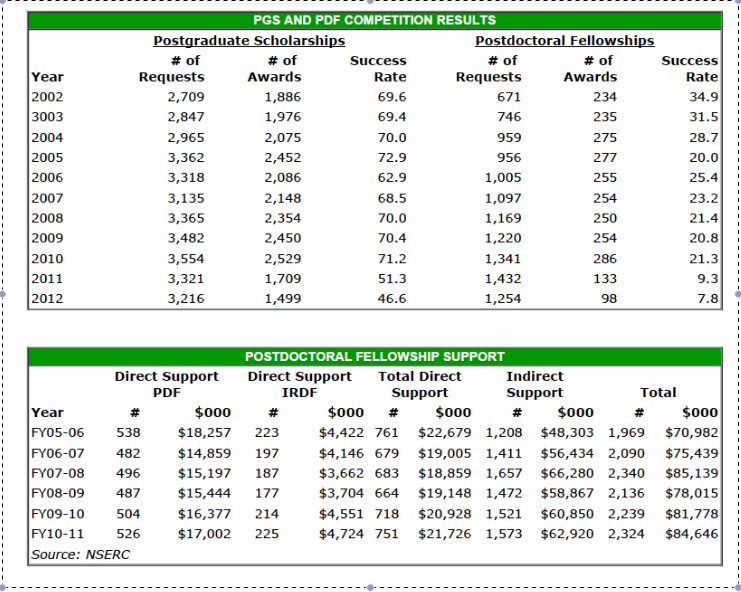 First, Nassif, I guess it’s unclear, but I think the issue with the table above (from the Re$earch Money article) is that the 133 fellowships awarded in (early) 2011 will be counted in the 2011/2012 line. So I think that table is actually quite irrelevant to our complaints! To be fair to Re$earch Money, I don’t think the 2011/2012 data is publicly available yet. I just hope that table wasn’t being used by Ms. Blain in her presentation! Well I’m glad NSERC is at least attempting to address the post-doc complaints, yet there are several things in these two articles that I would like to comment on. I don’t think it’s misleading at all! The reason the traditional PDF program is so competitive despite the insultingly low salary is that it allows the holder to have *two full* years of a job working with the top people in the field. In particular, this means at least one year to focus on research/CV-building without needing to worry about finding the next job. Moreover, the “complex package” (-Ms. Blain) of PDF funding mechanisms consists of programs (IRDF, CREATE) that are simply not applicable to the research fields of many (most?) PhDs, and so the reallocation to these other programs is, in effect, a cut in the postdoc opportunities for many. 2) In the Re$earch Money article, it is explained that NSERC realizes many new PhDs won’t be able to find work in academia, and so the postdoc reallocations have been made with an eye towards training more people to work in industry. I guess this is laudable on the surface, however, as indicated above, one would be very lucky to have happened to pick a field for which there happens to be a CREATE program in the area, or where there is a company willing to do the paperwork to fund an IRDF (see above comment!) I also dispute that the post-PDF career aspirations of a recent PhD should be any of NSERC’s business (rather than just funding the best possible scientists/engineers/mathematicians to do what they do best). Finally, while it is certainly true that there are way more PhDs being produced than new academic positions, it does not necessarily follow that there were more NSERC PDFs being funded than new academic positions. Step 2) Move hundreds or even thousands of kilometers for 6 months. Step 3) Use up the 6 months worrying about finding the next job (GOTO Step 1). It is my (our?) issues with the CREATE program *as it pertains to postdoc funding* that seems to be not well understood by NSERC. I am sure the individual programs themselves are all very worthwhile initiatives. My objection is that it is being viewed and funded by NSERC as a replacement to the traditional PDF program. I also don’t understand how the simple fact that UBC happens to be home to ten CREATE programs demonstrates its success. That line seems to be nonsense. 1. I understand that the tables in the Re$earch Money article were provided by NSERC. 3. Some aspects of Blain’s letter may sound like a third world bureaucratic approach to legitimate concerns about science policy, but to be fair, one has to factor in that she was answering my –somewhat butchered– article in the Ubyssey about the effect of the cuts/changes on UBC. That’s why (I think) she brought up the 10 CREATE granted to UBC, but also the funding for PIMS and BIRS, even though PIMS is a network of 9 universities in the West, and BIRS is nothing short of being the most international of Canada’s research initiatives, with the US National Science Foundation being its largest funder.